Political outrage sparked by the disappearance of a dissident Saudi journalist is not just damaging the reputation of a key US ally -- it's now threatening the authority of President Donald Trump himself. The possible murder of Washington Post columnist Jamal Khashoggi at the Saudi Arabia consulate in Istanbul has unleashed forces in Washington that are putting Trump's sharp turn away from traditional American foreign policy values to its most stark political test yet. 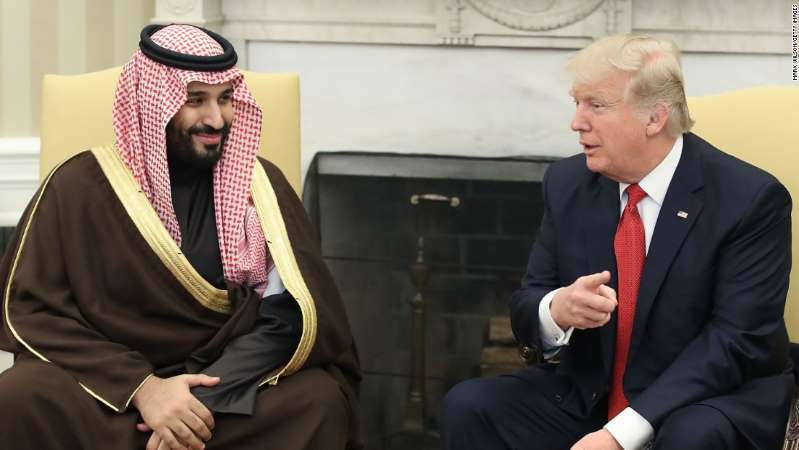 And there are growing signs that the White House may be unable to thwart fast-building pressure in Congress for action to punish Saudi Arabia and rein in its ruthless de facto leader, Mohammed bin Salman, tapped by the White House as America's anchor in the Middle East. The President, with his dealmaker's instincts, has inserted Saudi Arabia into a foreign policy designed to leverage US power for material gain rather than for global moral leadership -- and has argued the current crisis should not derail a commercial relationship worth billions of dollars. But such is the anger in Congress over the US-based Khashoggi's fate, that support is building for an effort to impose a change in Trump's strategy, much as lawmakers did when enforcing sanctions on Russia against his will. "If they lured this man into that consulate, they went medieval on him, and he was killed and he was chopped up and they sent a death crew down there to kill him and do all this, that would be an outrage," Republican Sen. Marco Rubio said on CNN's "State of the Union. "Just because they're an ally in an important mission, which is containing Iranian expansion in the region, cannot allow us to overlook or walk away from that. It undermines our ability to stand for morality and human rights all over the world," Rubio said on Sunday. Saudi Arabia has denied killing Khashoggi but has not provided evidence to explain his disappearance from the consulate. That being the case, Rubio called on Treasury Secretary Steven Mnuchin to cancel a trip to an investment conference in Saudi Arabia later this month. "I don't think any of our government officials should be going and pretending it's business as usual until we know exactly what's happened here," Rubio said. The White House has sought to slow a rush to judgment against the Saudi government amid demands for immediate sanctions. Trump's ascent as a political leader in 2016 was a lesson in how the traditional foreign policy orthodoxy, in which moral values and a sense of America exceptionalism and democratic leadership -- a strain of thought that Rubio represents -- have been eclipsed in the Republican Party. But the Saudi drama appears to be becoming a rare case in which clamor for action is building across political divides that could threaten the President's primacy in foreign policy and emerge as a genuine constraint on his power. Former Democratic presidential candidate Bernie Sanders, who is in many ways a political opposite of Rubio and is an independent senator from Vermont, also called for action on "State of the Union" Sunday. "I think one of the strong things that we can do is not only stop military sales, not only put sanctions on Saudi Arabia, but most importantly, get out of this terrible, terrible war in Yemen led by the Saudis," Sanders said. There are signs that political pressure is beginning to tell, and that a President who has shown little concern for press freedom and repeatedly courted autocrats accused of gross human rights abuses, is becoming uncomfortable with repeated questioning on the issue. "Maybe especially so because this man was a reporter. You'll be surprised to hear me say that, there's something really terrible and disgusting about that if that was the case so we're going to have to see," Trump told Lesley Stahl in a "60 Minutes" interview broadcast Sunday. "We're going to get to the bottom of it and there will be severe punishment." The White House has not specified the nature of the steps Saudi Arabia could face. But in the same interview the President also reiterated his concern that any action should not deflect from his own mercantilist instincts — a desire to use American power to maximize economic gains. "It depends on what the sanction is. I'll give you an example, they are ordering military equipment. Everybody in the world wanted that order. Russia wanted it, China wanted it, we wanted it. We got it, and we got all of it, every bit of it," Trump said. Asked by Stahl if he would cut off that order, the President said: "I'll tell you what I don't want to do. Boeing, Lockheed, Raytheon, I don't want to hurt jobs. I don't want to lose an order like that. And you know what, there are other ways of punishing, to use a word that's a pretty harsh word, but it's true." The President's reshaping of American foreign policy to prioritize job creation and financial might is a centerpiece of the case he is making to voters ahead of the midterm elections in three weeks. He argues that after decades of being ripped off by friends and foes, the United States is now driving hard bargains, and claims to have engineered huge victories in trade disputes with Canada, Mexico, China, South Korea and Europe — despite evidence he has only made moderate changes. So the question of what the United States gets from its relationship with the Saudis is not just a geopolitical one as it has been for most past presidents — it strikes at the heart of Trump's identity as a politician. Trump came to power faced with a question with which presidents have wrestled for decades: how to reconcile Saudi Arabia's poor human rights record, its tolerance of radical Islam and its stifling of dissent with its role as a fulcrum of US foreign policy and vital strategic position in a treacherous region and key partner in issues like counterterrorism, Afghanistan, and intelligence cooperation. The President's solution initially appeared to be to ignore it, after traveling to the kingdom on his first foreign trip and marveling at the lavish welcome that he received. Trump and his son-in-law and Middle East fixer Jared Kushner enthusiastically embraced the crown prince, or MBS as he is popularly known, and saw the kingdom as a powerful partner in a new effort to ratchet up confrontation with Iran across the region. They eagerly accepted the notion that MBS was a young reformer intent on building a new, more open kingdom, easing its reliance on oil and transforming the leadership of a country led in recent years by ailing and aged kings. But in practice, MBS has alarmed US allies with his erratic behavior, escalated a Saudi war in Yemen against Iran-backed rebels that has killed thousands of civilians and sparked a public health crisis, and emerged as a ferocious leader who has caused repeated awkward questions for the White House. All that has created an awkward visual for Trump, who prides himself on his strong leadership and his ability to win respect from foreign strongmen, since MBS's behavior appears to show little concern for the increasingly difficult political questions he is causing for his American friends. For a politician such as Trump, who is unusually protective of his own image, the sense that he has been embarrassed might be as much a reason to rein in MBS as disgust at actions that cut against traditional US foreign policy values. And if Trump will not act, it's clear that leading figures in Congress plan to in a way that could make a powerful statement that despite Trump's "America First" approach, traditional foreign policy values still hold some sway on Capitol Hill. James Rubin, a former assistant secretary of state in the Clinton administration told CNN on Sunday that lawmakers would seek to destroy the sense of "arrogance" shown by MBS in his apparent belief that he could act in such a manner drawing the condemnation of Washington. "I suspect they are surprised in Saudi Arabia. They must not have expected this kind of reaction or they wouldn't have done this," Rubin said. "Whether President Trump does this himself, or whether it is forced upon him by majorities in both houses, I believe this is the end of the full embrace by the United States of Saudi Arabia."